This is Masoud from May this year. He is about 1.5 years old in the photo. Isn't he handsome? He is a rough coated littermate brother to Helmut and Marlowe. We originally called him Neil as his baby name. Here he is at 6 weeks. Maybe these pics will also help others doing breed ID and trying to guess how old a puppy looks as he is through the various growth stages? As happened, I had never had a rough coat in the previous near twenty years with Anatolians, then boom, I have four out of seven! Coco, the chocolate sister, and these three rough coated brothers, Masoud, Helmut and Marlowe! 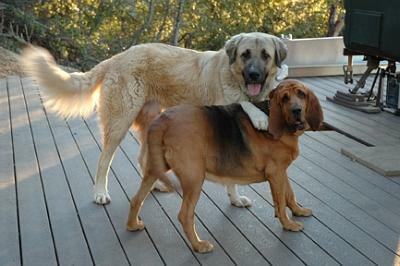 Both parents are standard medium coats as are three littermates. I've posted pics on Jasmine and Bella previously. I still need photo updates on one boy, Lincoln. :) So far, I think they are turning out awesome and everyone loves the temperaments. Fingers crossed on the hip films to come after their we celebrate their second birthdays in October. No Anatolian in this pic. 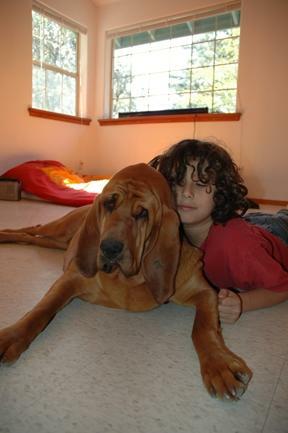 I got this lovely 2006 photo from Vera, showing her son Gabriel, with a pretty bloodhound named Daisy. Such a handsome couple! I think Daisy is about two years old in the photo. 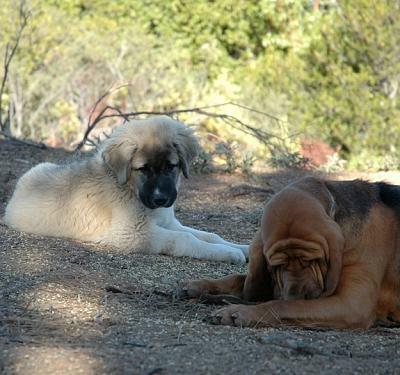 Now here are Masoud at 3 months with his new friend Daisy in 2007. Looks like he's already catching up with her in this pic! 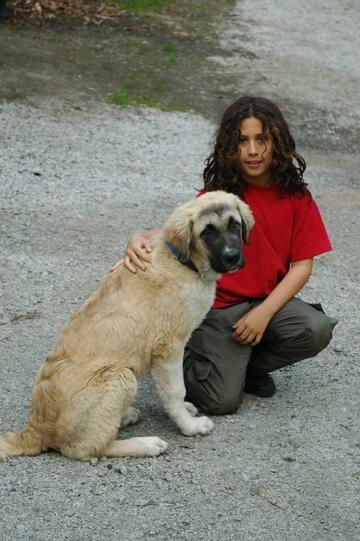 Here's Masoud at 5 months, with Gabriel. 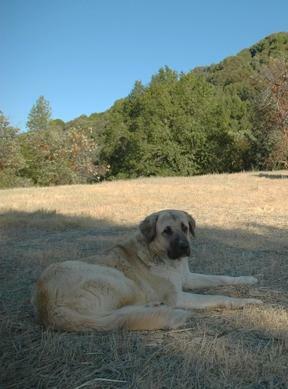 And here is a pic of Masoud at about 1.5 years with Daisy. Did she shrink?! Masoud is doing excellent! What a sweet boy he is, a really wonderful personality. He is really tall and has just filled out. For a long time he was really thin and gangly, with this enormous handsome head. In the last couple of months he really changed into his adulthood. He loves being up on the property, and it really is great seeing him do his thing. He truly is a guardian in every way. I will remind our vet about the upcoming x-rays. We're hoping to get the whole litter cleared for hip soundness. (our previous litter of 2003 OFA screens are here). 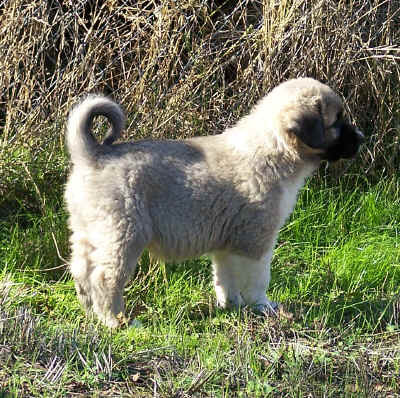 Hip dysplasia is a potential problem in large breed dogs. Boone, the father of the litter is a new dog for my bloodline, and while he tested clear, that information is not good enough as a stand alone. There hasn't been a lot of history in tracking the hip soundness in his line and occasionally a pairing of otherwise good dogs produces more than their share of hip problems, and this can indicate some genetic issues. We're all hoping for the best that this combination of traits from my girl Semavi Kadinsi Zor (the mom) and Old Glory Boone (Dad), will help us in making the right choices for the future of our breed. Lovely dogs. I did not know this breed. It's really beautiful.